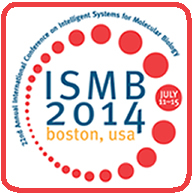 The ISMB 2014 was held on July 11-15, 2014 in Boston, Massachusetts, USA. Pictures of the ISMB2014 conference posted to Flickr can be found here. The ISMB 2014 official twitter account is used to post updates related to the ISMB 2014 conference. Twitter users use the #ISMB hashtags to tweet about the conference. The list of presenters honored with awards can be found on the ISMB 2014 Conference website and the corresponding video can be viewed here. The ISMB/ECCB 2013 was held on July 21-23, 2013 in Berlin, Germany. The full listing of presentations currently available can be found here. The presentations can be viewed by anyone and are not restricted to ISCB members. Pictures of the ISMB/ECCB 2013 conference posted to Flickr can be found here. The ISMB/ECCB 2013 official twitter account were used to post updates related to the ISMB/ECCB 2013 conference. Twitter users used the #ISMBECCB hashtags to tweet about the conference. The list of presenters honored with awards can be found on the ISMB/ECCB 2013 Conference website.